Habitat: Located in open woodland and forest regions along the Pacific slope of Mexico. Diet in the Wild: Considered omnivorous feed on a large variety of foods including: fruits, berries, nuts, invertebrates, and small rodents. 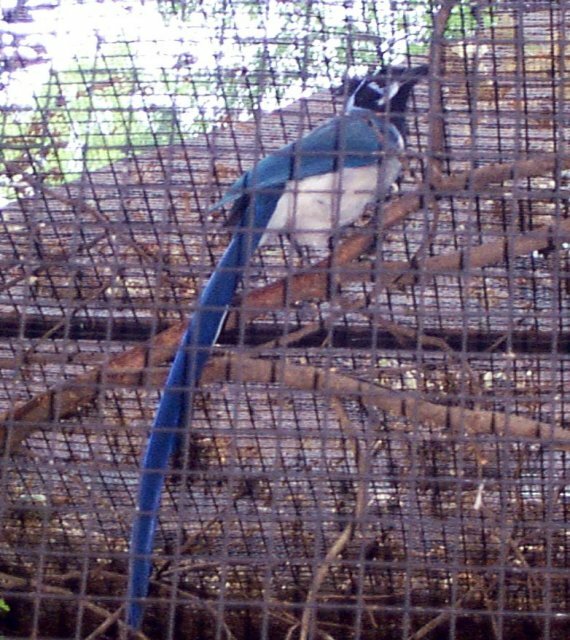 The Black-throated Magpie Jay ia a beautiful large bird that has a blue body with a black throat and white chest. The tail is long and blue with some white tips. The head is black with a slight amount of blue on cheek area. This is a large bird measuring about 8 inches in body and another 13.5 inches for the tail. The weight is approximately 225 to 251 grams. They will remain in a small family group between 5 to 10 individuals. The oldest pair in the group will act as the breeders while the others will serve as helpers in nest construction and feeding after the young are born. The Magpie Jay will place its nest usually in a thorny tree at hights up to 100 feet. This will allow extra pretection from predators during the long nesting season from November to July. Also during incubation periods the female will not leave the nest. A pair of black-throated magpie jays reside at the Fort Worth Zoo. The pair is located in Bird Row with a large corner cage. 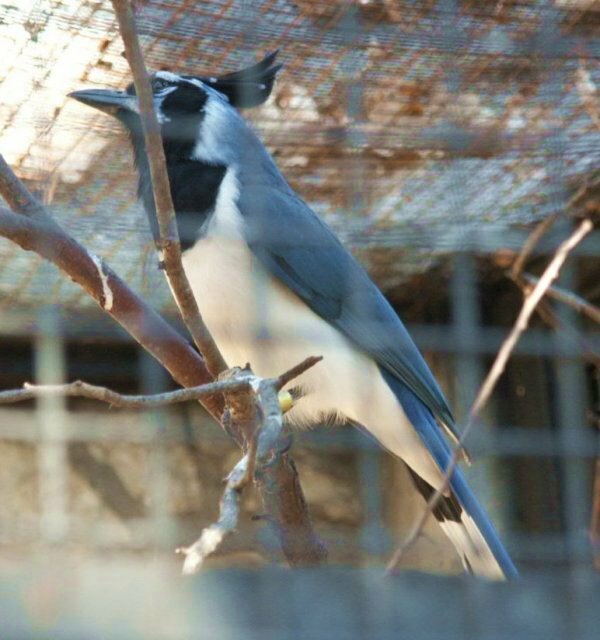 During visits the magpies can be seen sitting atop many perches within the cage making a variety of harsh, loud calls. Beletsky, L. Costa Rica, The Ecotravellers Wildlife Guide. AP Natural World Academic Press. 1998. San Diego, California. Davis, L. The Field Guide to the Birds of Mexico and Central America. University of Texas Press. 1972. Austin, Texas.